The Everything and the Nothing is subtitled Outtakes and Ephemera from the Discourses of the Withered in 13 Parts but it’s presented as a single, uninterrupted piece of seventy-minute duration. It picks up where its sister release leaves off with heavenly tonal waves and proceeds to weave similarly rapturous material and field recordings into an episodic travelogue. Signaled by the fleeting appearance of voices, the mood shifts twenty minutes in, becoming even more immersive in its reverb-drenched unfurl. A short recorded section of Indian music (voice and tablas) appears halfway through, as does—unusual for Celer—a humungous bass rumble that escalates to such an eardrum-shattering level you’ll need to lower the volume before the speakers blow. The recording then enters a rather sci-fi-flavoured zone where limpid pools of synth tones softly waver, and shortly thereafter pipa playing (by Rob Farley) lends the recording an overtly exotic quality before the tonal waves re-appear to carry the piece to its conclusion. 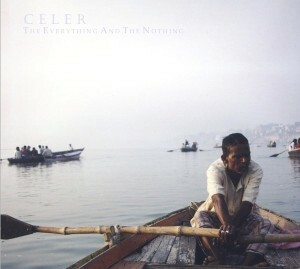 Celer are rapidly emerging as one of a crop of highly talented new ambient artists doing the rounds of worthy and reputable labels. With no finer credentials that the release of their “Mesoscaphe” album on Spekk last year, and more recently their sublimely minimal “Nacreous Clouds” on US label, and/OAR (well worth repeated listening), Celer’s husband and wife team, Will and Dani have come up with another fine release in the form of The Everything and the Nothing, for Infraction. With their usual attention to fine packaging and presentation, this beautiful work homes in on skilfully assembled moody drift-ambient territory as exemplified by the likes of luminaries such as Biosphere, and Seefeel, or possibly Lull. Utilising elegantly cascading whorls of orchestrated sound, looping around a central theme that is sparsely populated, yet utterly hypnotic as it gently unfolds, this 71 minute epic makes several transitions, each transition being separately titled with oblique and enigmatic names such as Dancing as Terrorism, The Sangha Inside, Chest Mulct, or So Very Sari I Swear. Essentially, all of these elements occupy similar sonic territory, with occasional intrusions and deflections to maintain interest, The Everything and The Nothing is a glimpse into the world of the sublime, a cavernous dronescape that maintains a steady discourse with the spiritual and etheric world, shimmering and sparkling with a rich and rare beauty. Absolutely Essential listening.